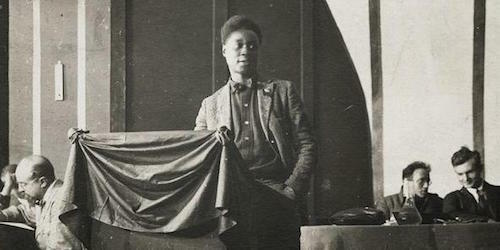 Claude McKay speaking in the Throne Room of the Kremlin, The Crisis magazine, 1923, via Verso Books. From Russia’s imperial amnesia to 21st-century American slavery, here are this week’s top picks in imperial and global history. In a provocative March 27 column in the Financial Times entitled “Brexit and Imperial Amnesia,” Gideon Rachman chided the English for, as one reader put it, “a serious misunderstanding of [Britain’s] oppressive imperial past.” Aside from generating a lively and entertaining discussion of the issue, Rachman’s piece gave me a framework for understanding an even more remarkable article I had just read in the March 17 edition of Nezavisimaya gazeta. It was entitled “Главное—не повторять ошибки” (“The main thing is not to repeat mistakes”) and was penned by Aleksandr Khramchikhin, the Deputy Director of the Institute for Political and Military Analysis in Moscow. 18th century handkerchiefs are sometimes mentioned in contemporary hand-written letters, travel journals or account books connected to the Swedish East India Company trade. One reason for repeated mentions of such an accessory appear to be its multiple functions. Handkerchiefs were connected to sadness and emotions, snuff-taking, practical uses like wrapping up plants or catching insects, a beautiful present or invaluable during illness. It came in varied designs as one colour only, striped, checked or woven in more advanced diaper techniques or with printed patterns. The materials were either silk, cotton or linen – sometimes embellished with laces and embroidery. Silk has always been associated with costliness, but even cotton was still regarded as a luxury material in mid-18th century Sweden. It may also be noted that the limited amount of fabric needed for a small handkerchief, made it reasonable in price for a wider society. Judging by artworks of the period, this useful piece of fabric was normally tucked away in a pocket or concealed in some other way – probably due to traditions or practicality or etiquette. Two recent events should be of interest to radicals. First, the eruption and continuation of anti-racist struggles after the election of Donald Trump demonstrates forcefully that the current wave of Black liberation struggle begun by the Black Lives Matter movement has not yet receded. Second, 2017 is the 100th anniversary of the Russian Revolution, marking nearly a century since the moment workers and oppressed peoples came the closest yet to ending the rule of capital. Next What Does it Mean to Act with Humanity?